For most of his life, he lived in the basement of the West Weald Inn in the Cyrodilic city of Skingrad. He was an honorary member of the College of Winterhold. He collaborated with Arch-Mage Taris Rendil to develop the Frostcrag Apparatus Table, an alchemy lab in Frostcrag Spire. Avrusa Sarethi, an alchemist from Vivec City, came to Skingrad to train under Sinderion. He was also a connoisseur of wines, and was known to provide alchemy training in return for the local vintage wine from 3E 399. Sinderion's interest in the Nirnroot began when he purchased a dusty alchemical tome from an adventurer. Most of the recipes within were worthless, but one detailed a potion called the "Elixir of Exploration". This potion brought out the huge magical potential of the rare Nirnroot. He presented his findings at the Alchemical Symposium in the hopes of funding, but was turned down. In 3E 433, he hired the Champion of Cyrodiil to collect samples of Nirnroot for him. 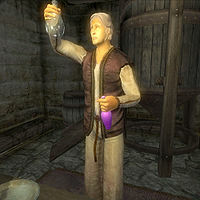 The Champion provided enough samples to complete Sinderion's research and create the strongest version of the elixir. Sinderion again presented his speech to the Alchemical Symposium in Rain's Hand of 4E 2. Over fifty years later, an adventurer named Obeth Arnesian brought a sample of Crimson Nirnroot to Sinderion. This variant of the common Nirnroot grows only in Blackreach, a gigantic cavern beneath the surface of Skyrim. A year later he sold his basement workshop in Skingrad and traveled to Skyrim, eventually coming to the Sarethi Farm outside Riften. Avrusa Sarethi had moved here after Vvardenfell was ruined during the Red Year of 4E 5. He passed on all his knowledge of the Nirnroot to Avrusa, who learned how to cultivate them. After a few months of preparation, Sinderion entered Blackreach using the runed lexicon provided by Obeth and set up a field laboratory in one of the Dwemer houses found within the cavern. He began researching the Crimson Nirnroot, but was killed circa 4E 58 in his laboratory by the denizens of Blackreach. In 4E 201, the Last Dragonborn came upon Sinderion's remains and completed his research by gathering samples of Crimson Nirnroot and bringing them to Avrusa.